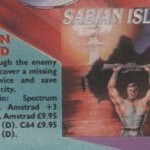 Sabian Island seems to be yet another game that was advertised to buy through mail order from a software company, without actually having ever being released. I don’t know how many games were ‘released’ as such in the 1980s but it certainly provides Games That Weren’t a rich vein of material to search through! In the game you recover a missing ‘time device’ to save New York from destruction. The cover shows a man in front of an island, holding a gun aloft above his head, while behind the island a nuclear explosion can be seen, which also sums up the plot of the game pretty well! The game was due for a multi-format release but seems to have not made its way onto the market for the CPC, Spectrum or C64 for whatever reasons. Presumably it reached far enough into its development for Skyslip software to put out an advertisement for it. The advertisement also shows other games that don’t seem to have been released so I do wonder if the company suffered a sudden collapse or was bought out by another company who quickly scrapped all the planned games and moved the programmers onto other projects. A review of the text adventure game A Simple Case of Espionage for the Spectrum by Crash Magazine states that Skyslip were a new software house created by Rock City Music, who at the time were a leading music distributor. Whether Rock City Music were/are connected with the famous Nottingham rock club ‘Rock City’ is unknown but the striking similarity in their names suggests its possible. Looking across other platforms, it seems Skyslip never managed to release anything on the CPC, though there is an entry for Sabian Island on CPC Zone, which states the release date as N/A. On the Spectrum they released three games, two of which are currently MIA on World of Spectrum, which fits in with the scarcity or non-existence of so many of their other games. On the C64, according to GB64 and Lemon64, they also released nothing. From this we can gather that in all likelihood Skyslip software was intended to branch out Rock City Music but for whatever reason it was quickly pulled, after having no less than seven games planned for release in its first year across all 8-bit platforms. This does of course provide a wealth of unreleased games for Games That Weren’t to follow up, with the likelihood that finding one game will also lead to the discovery of the rest. Can we find anyone connected to either Skyslip software or Rock City Music to explain what happened to the fledging software house?